Shady Creeks in GTA San Andreas, with Mount Chiliad in the background. Shady Creeks is a heavily-forested location in Grand Theft Auto: San Andreas, located in Whetstone, San Andreas. It is near Mount Chiliad and the town of Angel Pine. 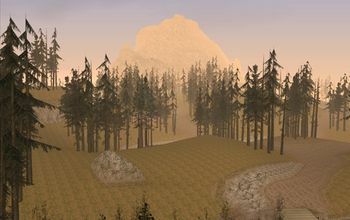 It is filled with trees and a decent sized creek (adjoining a basin named Shady Basin on GTA San Andreas' official website), hence the name Shady Creeks. Shady Cabin is also located in the center of Shady Creeks, close to Shady Basin. Like Back o Beyond, a nearby area, many myths focus on this area, most notably Bigfoot and Leatherface. The bridge going between this town and Leafy Hollow resembles the Bixby Creek Bridge in Big Sur, California. This page was last modified on 10 November 2012, at 22:38.